A fascinating plant with interesting foliage and a sweet scented flower is Massonia jasminiflora (see picture right). It is a small growing species and this is one of the attractions. when grown in a container and when in flower it does look very pretty. Rare in cultivation this is a South African bulb, flowering in late winter this is a plant for the enthusiast, or if you have right position on a sheltered patio it could grow well for anyone. As the name suggests, this is a fragrant species with a strong scent of jasmine when in flower. The flower itself sits neatly between the two leaves which show it if superbly. Coming from an area of summer rainfall, this is a plant for enthusiasts in a country with dry summers. You will need to provide this plant with a dry summer location. Definitely a well drained soil, we would strongly suggest a container with a free draining potting mix. Frost need to be avoided. Foliage appears in early winter followed by very pretty white flowers. 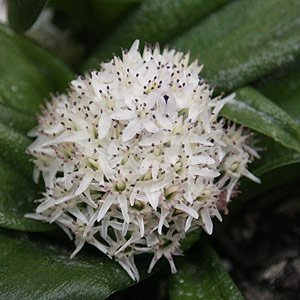 Flowers – White with contrasting black anthers.Flowering time – Late winter to spring. Foliage – Mid to deep green with typical two flat leaves that sit on the ground. The foliage appears in autumn. Easy from seed if you are patient, with up to 4 years from sowing seed to flowering sized plants. Massonia jasminiflora will also form offsets over time and these can be divided.